From skate parks to kitchens, the story of a cutting board like no other. 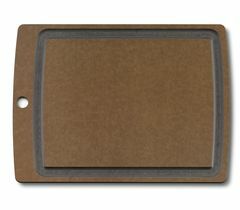 We recently added the Allrounder Cutting Boards to our range. Sustainable, dishwasher-safe and blade-friendly, these boards are the perfect match for our kitchen knives. Produced in the USA by our partner Epicurean where they are developed and made exclusively for Victorinox, they do much more than just look good in your kitchen. 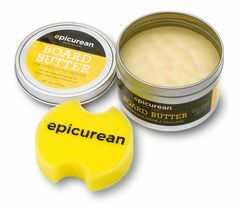 We talked to the Epicurean team to find out more about the story behind the boards and what makes them so special. Tell us how you came to create the cutting boards. What were the origins of the company? Epicurean was founded in 2003. We’d been building custom skate parks and we built over 450 around the world during the ten years we ran that company. The material we used to build half pipes, ramps etc. was eight feet long, but we needed only six feet for the skate parks. Since we didn’t want to throw the material away, we talked to our supplier, Richlite, to see if they could suggest any other uses for the leftover material. They happened to mention that restaurants had been using the material to make cutting boards for commercial kitchens for over 50 years. We thought it sounded like a great idea and we made a few samples, giving them to friends and family as Christmas presents. Everybody loved them. We decided to build a consumer-facing brand around these cutting boards, and everything grew from there. 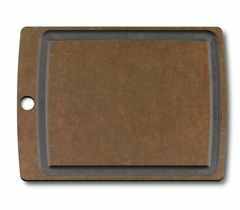 What makes Epicurean cutting boards special? How are they different from other cutting boards? First and foremost, the unique properties of the material we use ensure that these boards are knife-friendly. They don’t dull the blade of the knife as other harder materials may do, making them ideal if you wish to take good care of your knives. We use a very special material which we call wood fiber. It has the warmth and great looks of a wood product, but it performs like a plastic in that it is light, thin and dishwasher-safe. Our boards are also more resistant to deeper cuts from knives, meaning they are more hygienic and easier to keep clean. Tell me about the materials you use for the cutting boards. Where do you source them? The material is actually made from sheets of paper which have been saturated in a food-safe resin. The sheets are then placed in a machine which compresses them with heat and pressure, creating the final material. 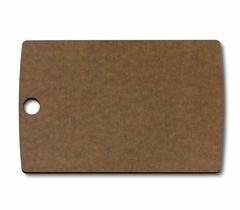 The standard board is comprised of between 55 and 60 sheets of paper pressed together. We work with a supplier who is FSC certified, meaning the wood used to make the paper is sustainably harvested. How do you ensure sustainability in your operations? We choose our partners very carefully. Not only is the supplier of our material FSC-certified and with GREENGUARD accreditation, they also have what is essentially a closed-loop energy system, with wasted resin being recaptured and used as fuel during the drying stage, minimizing their natural gas usage by 83%. We were very happy to partner with Victorinox and some of your sustainability practices have influenced our own development in this area. In our factory for example, we use a heat reclamation system where heat from our suction pumps is reclaimed and used to heat our warehouse. The entire building also has plenty of natural light so that electricity costs can be reduced. What would be your dream product to add to the range? Right now, we are working on a new set of kitchen utensils, but we’d love to add new materials such as stainless steel to our range. It’s also a dream to make art supplies like easels or painter’s palettes! Where do you find design inspiration for your products? Our design process very collaborative and we can take our inspiration from plenty of different sources. Most of our designs start off as very rough sketches, not quite on the back of a napkin but almost! They are then developed from there. We are always surprised at how well some of the ideas which we thought were pretty crazy do! We created cutting boards in the shape of the states which make up the USA. Some of the states make for a very unusual shape for a cutting board, but they have proved really popular. Now you know more about these incredible boards, you can check them out for yourself. The Allrounder boards come in two colorways and three sizes. 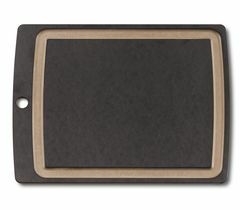 Not only dishwasher-proof but also heatproof, they make great trivets for putting under hot dishes or as platters for serving cheese or canapés. Get chopping!